Bruce Rock Engineering (BRE) was established in 1980 by Mike and Gay Verhoogt. 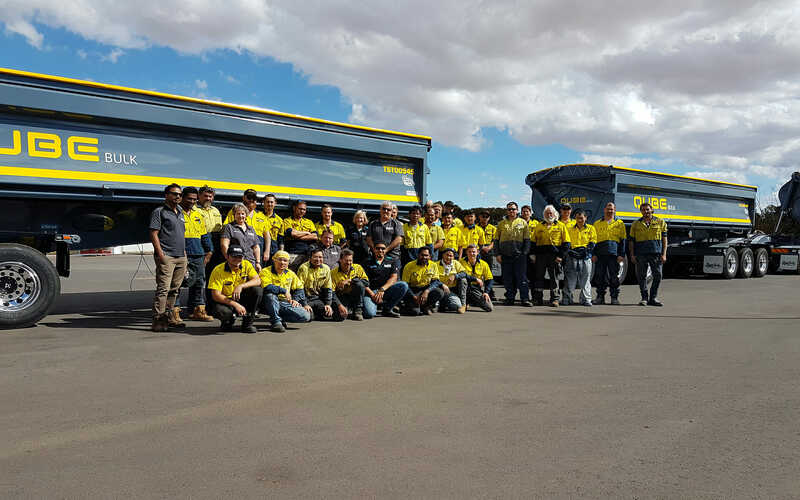 From humble beginnings, operating from a 300m2 workshop with one employee, the company has grown to include six business divisions, more than 100 full time staff, three state-of-the-art engineering facilities in WA, and support offices and workshops nationwide. Our service covers Western Australia, Queensland, New South Wales, Victoria, South Australia and the Northern Territory. With Damion, Brenton and Keenan Verhoogt now at the helm, BRE maintains its family values and commitment to quality, innovation and reliability. Supported by its complementary businesses Transbeam Industries and Bruce Rock Tyres, BRE provides a complete road transport solution to the agricultural, mining, industrial and general freight industries. Our full suite of products includes end tippers, side tippers, dollies, skel trailers, flat tops and drop decks, road trains, dry and refrigerated trailers, live bottom trailers, Performance Based Standards (PBS) and custom designs. All our products are designed and engineered with a focus on quality and innovation. Using SSAB Hardox and Strenx steels, our products are designed for maximum payloads with a longer lifespan. We are the only trailer manufacturer in Australia to be part of the SSAB ‘Hardox in my Body’ and ‘My Inner Strenx’ programs, representing a rigorous quality certification process. We offer the lightest tare weights in Australia to maximise clients’ profits while minimising maintenance and operating costs. Find out more about our industry leading manufacturing process here. We are the sole Australian distributor of Wabash National dry freight and refrigerated trailers, and the exclusive distributor of Etnyre Falcon live bottom trailers in WA, SA and NT. We are at the forefront of PBS; multi-combination road trains are one of our areas of specialisation. We provide full support services nationally, with a sales office operating out of six facilities located across NSW, Victoria and Queensland in our partnership with Royan Truck and Trailer Repairs. Our services include: insurance, modifications, blast and paint, trailer maintenance and heavy vehicle spare parts, laser wheel alignments, site work, heavy vehicle servicing, and welding and repairs. To become a leader in the Australian road transport industry, renowned for excellence in innovation, quality and value. We collaborate with our customers to design, manufacture and support world-class road transport solutions. Our strong family values of RESPECT, INTEGRITY and FAIRNESS, and our strong safety ethic, forms the foundation and ethos of our culture.